The Stiletto TBM14RMS is a 14 Oz. TiBone Milled Face Hammer with 15.25 in. Straight Handle. The Hammer has a Patented Side Nail Puller that eases 16p nails out with one 180 degree motion and Stiletto's signature Magnetic Nail Starter. The TBM14RMS has the comparable striking force of 24 Oz. Steel hammer and is Recommended for Polebarn, Concrete, Framing and Remodeling. Stiletto Tool Company has been synonymous with high quality hand tools dating back to 1849. With its long history and strong reputation, the brand has evolved into the modern day standard for innovative, lightweight, ergonomic, productive, and professional tools. We set the standard with our line of premium titanium hand tools that span numerous trades such as framing, remodeling, finish work, siding, demolition, concrete, and drywall. Titanium is 45% lighter weight while providing the same striking force and strength as steel. Titanium tools also produce 10 times less recoil shock which helps reduce carpal tunnel syndrome. The combination of these features means less down time, more productivity, and most importantly less pain while working. Tbook.com crawls the web to find the best prices and availability on Hammers and related Tools and Hardware products like Stiletto 14 oz. TiBone Milled Face Hammer with 15.25 inch Straight Handle. For this page, related items include products we find that match the following keywords: "Hammer" at our vendor partner Home Depot. Stiletto 14 oz. 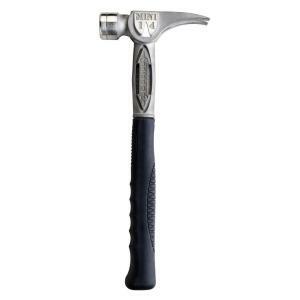 TiBone Milled Face Hammer with 15.25 inch Straight Handle is one of 151 Hammers and related products listed in the Tools and Hardware section of Tbook.com If you have any questions on this product, please give us a call at 734-971-1210 during the hours of 9am - 5pm EST for assistance. Thank you for shopping at Tbook.com, the Internet Department Store!